PDP is releasing a new Nintendo Switch Pro-style controller that features a 3.5mm headphone jack on the bottom. You know – like every other major platform holder already does in their controllers? A big miss on Nintendo’s own Pro Controller was that there wasn’t a headphone jack built-in for chatting. The downside? This PDP controller, which is officially titled the Faceoff Deluxe+ Audio Wired Controller, is (as the name implies) wired. So we’re still waiting on a wireless controller to offer the same functionality! PDP’s new controller will arrive sometime this summer. Will you be picking this one up? Listen. Play. Chat. For the first time, you can plug your headset into a Nintendo Switch controller and chat with our new Faceoff Deluxe+ Audio Wired Controller! With the recent announcement of communications expert, Vivox, providing the development tools used to create true in-game chat with Fortnite on the Nintendo Switch, the timing is perfect for this new innovative controller. 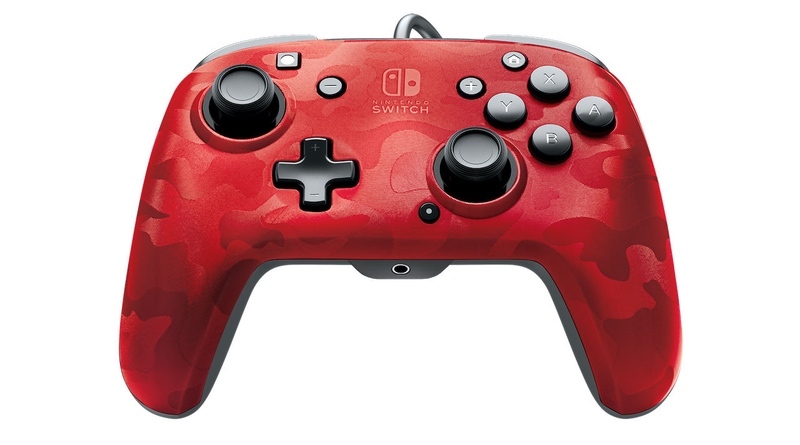 Launching Summer 2019, our new controller features support for Vivox’s integrated in-game chat, premium game audio through a 3.5mm audio jack, patented on-board audio controls that let you adjust the audio on the fly right from your controller, two additional programmable buttons, and an interchangeable faceplate – making it the best Nintendo Switch controller for serious gamers. Simply plug in the controller, and your go-to headset, and you’re ready to start commanding your team! Pre-orders begin this May on pdp.com and at participating retailers. Just like our other Faceoff Controllers, this new Deluxe+ Audio Wired Controller allows you to swap out and snap in different faceplates with our unique interchangeable design! You can further customize your gameplay with the dual programmable paddle-style buttons on the back. Each controller has a 10-foot fixed USB cable for plenty of room to play with ease, responsive low-friction metal analog sticks, and a 3.5mm audio jack. Listen to your game’s audio with clarity, chat with friends without the hassle of a work-around, and customize your controller to play your way. The Faceoff Deluxe+ Audio Wired Controller is the first of its kind in the market and will be available for pre-order this May on pdp.com and at participating retailers. The Faceoff Deluxe+ Audio Wired Controller will be available at launch in Red Camo and Purple Camo for $24.99.